They were all crazy. These people that I thought I knew. Maybe we weren’t on a first name basis. Okay, honestly, we never talked. But, we spent a lot of time together. I had come to understand them and a certain amount of trust had built up, and I liked to think that they had reason to trust me too. That trust was seriously shaken and I worried about what that meant for my safety. I like to take the train, but I also spend a lot of time in the car. I commute to two different locations. One of them is about 45 minutes away the other is about 30. Both involve lots of freeway driving. What time do you head out to work? I’m an early bird and like to be at my desk by 7:00am. Most days, whether it’s the train or the car, I make it. Occasionally, if I’ve had a late night, (Working! A late night working, I gave up partying many children ago), I’ll end up heading into the office later than normal. Yesterday was one of those days. And it was like driving in a different country. Leave my house and head to the freeway taking 200 South through town. It goes right past the high school, but the kids don’t start making the road congested for another 20 minutes. The freeway will slow down around 2100 South in Lehi, and then again at Point of the Mountain down past Bangerter Highway, around 123rd South and again just before the 215 exit at 72nd South. Then, I exit the carpool lane, and get to the right to make my exit at 5300 South. I’ll listen to the first couple of traffic reports to find out if there are any crashes that might affect my commute and then I switch the radio over to either a “modern country” music station or an “oldies rock” station. Sometimes they sound remarkably similar. My commute is predictable. Enough so, that I can often use the cruise control for much of the way. I know what to expect from the other drivers. They know what to expect from me. We may not be able to see each others’ faces in the early morning darkness, but we trust one another. Yesterday that trust was severely tested. 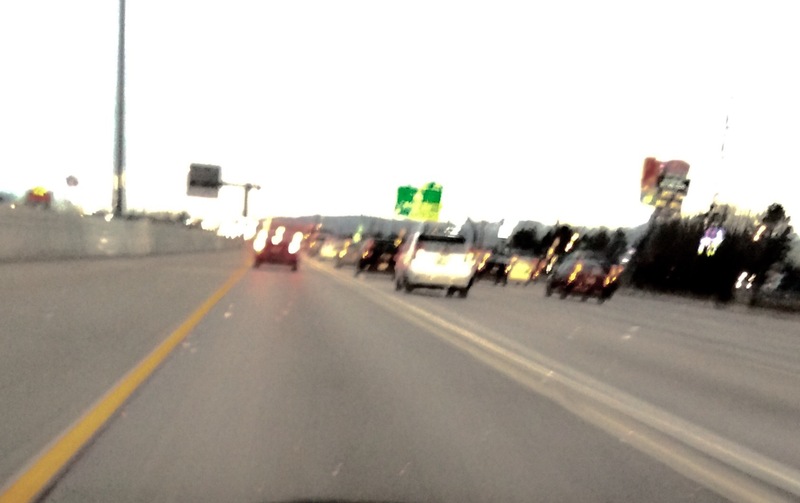 Utah’s carpool lanes are designated by double white lines. Those lines are sometimes all that separates the carpool lane moving at 70 MPH and the bumper-to-bumper mainlines stopped or creeping along at 5 MPH. (That’s why I’m willing to buy an Express Pass to get there just a little sooner.) It’s illegal to cross the double white line. It’s a $175 fine. Every few miles the double white lines turn to single dotted white lines and people can merge in and out of the carpool lanes. All my commuter buddies understand this. I’ve seen maybe one violation in a month. And it’s typically someone who forgot to get out of the lane before their exit and then has to scramble to avoid a lengthy detour. Yesterday, as I headed into work an hour or so later than normal, my commuter buddies must have already been at work. In the space of about 5 miles, just as the traffic starts to slow at Point of The Mountain, cars freely merged and exited the carpool lane, crossing the double white lines on a whim. Mainline going 68 MPH and the carpool lane is at 72? Jump across the double white line! Guy in the carpool lane wants to drive 75 MPH and you think you can do 79 in the mainline? Jump the lines to get back out. It wasn’t just that my trust was shaken. It was that I now didn’t know what to expect. As I’m cruising along at 70 MPH next to the stopped mainline, is someone going to cross the double white line and pop into the carpool lane unexpectedly? If they do, will I have time to slow down enough to avoid hitting them? The cruise control was a luxury I could no longer afford. My commute went from boringly predictable to a turn at the track with drivers jockeying for position and thinking that 2 second advantage they gained is going to be the difference between the checkered flag or finishing out of the money. Fortunately today I’m back to my normal commute time. Life went back to normal. I wanted to wave at the cars on the other side of the double white lines and say, “Hey, I’m back. Sorry I missed y’all yesterday.” But, of course, I couldn’t really do that as I sped past them at 70 MPH.